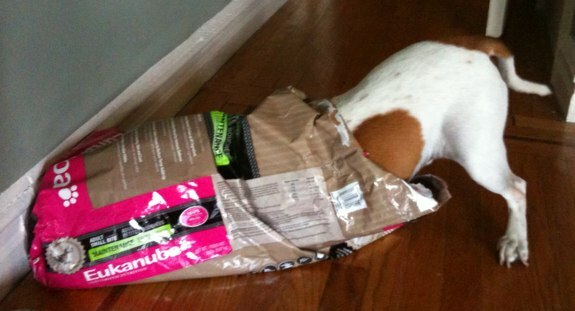 Our dog Buddy just had one of those wonderful experiences… Cleaning out the dust from a bag of dog food… I think he could live in that bag if it were an option! Sometimes I wish I were a dog… He’s got a good life! A couple years ago our dog Buddy was having problems with his eyes. We went to see our vet, Scott Luckow at Broadway Animal Hospital in Riverdale (Bronx, NY) and he referred us to an ophthalmologist. He told us to get a diagnoses from her, and then he could provide ongoing treatment. It’s now two years later and Buddy’s condition is clearly chronic, but well managed by the drops the ophthalmologist prescribed for us to give him each day. A couple weeks ago Dan realized he was running out of the drops for Buddy and called the ophthalmologist for another prescription. The ophthalmologist wanted Dan to bring in Buddy since it had been a while since she had seen him. That was understandable, but since the condition is chronic, Dan wanted to have our regular vet, Scott Luckow take over the ongoing care and only go see the ophthalmologist if something changed. Let’s just say that they were familiar enough with what was going on that when I went in the receptionist asked how Buddy’s eyes were. They knew dealing with that issue was the primary reason for the visit. However Luckow refused to give me the prescription saying he wanted to talk to Dan first, and that Dan should call him on Monday during his authorized time for calls (it’s often difficult to actually get through at the designated times). He also indicated that he wanted Buddy seen by the ophthalmologist again. The problem was we’d been close to running out of the drops for a week and a half and we needed at least a stop gap prescription to tide us over until we could have the issue resolved. When I got home and told Dan, he called his office and waited for a callback. Finally he figured he’d just drive up there and talk to Luckow in person. While he was in the car they returned his call and said, “no” – they wouldn’t give a stop gap prescription. Since Dan was already on his way, he continued up. In our eyes this was an urgent matter. If Buddy doesn’t get his drops, the next day his eyes are all red, and the day after that they’re oozing puss and he can’t open them fully. Running out of drops wasn’t OK with us. When Dan got there the receptionist (Luckow’s wife) told him to wait – that Dr. Luckow was “reviewing labs”. He made Dan wait a full hour. It would be one thing if he were in the middle of seeing a patient, or if he were in the middle of surgery, but the fact that he wouldn’t step away from paperwork to talk to a customer for a couple minutes made Dan even more livid than he already was. When Luckow came out he wanted Dan to sign a piece of paper saying Dan was not getting the proper medical care for Buddy and that Luckow would not be held responsible for anything that happened. This was completely baffling to Dan… We had gone to see the ophthalmologist Luckow told us to go see and now he wouldn’t take over the ongoing treatment when he had all of the paperwork with the diagnosis in his files. Scott Luckow talks about being a country vet in the city, but when push comes to shove he apparently won’t do anything outside his narrow credentials. All he had to do when we called and explained the situation initially was make a call to the ophthalmologist (he told us to go to in the first place) to coordinate the handover of care. But he didn’t do that. He knew we had been trying for a week and a half to get the situation resolved and that we were running out of medication, and he knew how quickly bad things happen when we did run out of medication. Yet he played a game of telling us to call in, then saying “no” over the phone, and when pushed to the wall by an in-person visit he pulls out a liability waver form to give even a single stop gap prescription when he knows the diagnosis and knows what we’re asking for is an accepted treatment for the problem. We have heard of other people who have had issues with Dr. Luckow. We knew he was a bit quirky and could be “opinionated” at times, but he seemed generally competent. However this puts a completely different perspective on things. When you really need him – he just won’t be there for you. That’s just not acceptable. Dan considered a number of other vets that neighbors suggested, but in the end he took my advice and went back to the vets I had gone to for years with my previous dog, Sherlock – West Chelsea Veterinary Hospital. The vet at West Chelsea was wonderful. She took a look at the reports from the ophthalmologist and wrote the prescription without hesitation. They’re a bit more expensive and somewhat inconvenient for us to get to, but they’re good, competent, no-hassle vets and that’s worth the extra cost and hassle getting there. First, this isn’t about money. The vet we’re going back to costs about 50% more than Luckow. Had Luckow given us a stop gap prescription we would have spent the money and gone back to see the ophthalmologist. The issue was his refusal to give us medication when we were running out and needed it urgently. And the secondary issue was his poor customer service. Second, Luckow’s final claim that there were liability issues is ridiculous. The vet Dan went to see today did what we asked Luckow to do and did it without hesitation. Both are experienced vets in established practices. We simply can’t fathom why Luckow didn’t give us the same level of service as the other vet.